It’s the day after Thanksgiving. If you’re a holiday purist like me, that means you can start thinking about what comes next. In my case, the next holiday I celebrate is Christmas. 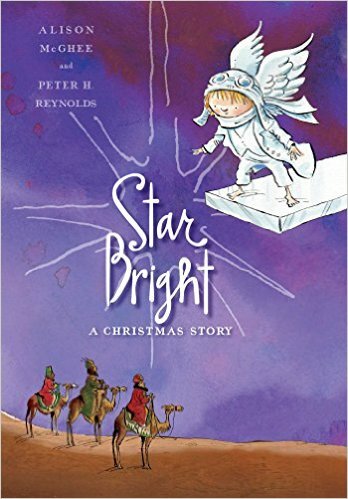 And that means it’s the perfect time to look at STAR BRIGHT, an enchanting picture book written by Alison McGhee and illustrated by Peter H. Reynolds. The story is only 261 words (unless I counted wrong). And, it is the perfect answer to anyone who thinks short writing packs less punch than longer writing or that stories can’t shine without the copious use of adjectives and description. This is one of the simplest, sparest stories I’ve read in some time. That’s what makes it so beautiful. The story is boiled down to the essentials. Nowhere in the book do the words “Jesus,” “shepherds” or “wise men” appear. And they don’t need to. It’s obvious what the story is about. The subtitle of the book is “A Christmas Story,” but I’d argue even that isn’t needed. There you go, it’s all you need. An angel wants to give the baby a gift. The problem is identified 44 words into the story, and the rest of the story is focused on resolving that issue. The angel worries she is too small to provide a worthy gift. This is not a new concept. Other picture books have explored it, including THE LITTLEST ANGEL. But, it’s such a universal emotion for children and adults that it’s instantly relatable. And, of course, it’s beautifully stated: “The universe felt so big. And, she felt so small.” And, in a stroke of genius, the angel’s weakness leads her to discover the perfect gift. If you’re a picture book writer, read this story for its structure, its beautiful language and its inclusion of only the essential items. If you’re a parent, teacher or librarian, add this to you holiday collection for its emotional take on the topics of love, light and gifts. And, if you’re an art lover, read it for the gorgeous illustrations that are a welcome departure from many other holiday books. Reynolds relies on deep purple, gold and white with nary a hint of red or green. And, I adore his modern take on angels. While I have your attention, don’t forget to buy a book or two for any holiday gifts you might shop for. If you can get those books from an independent bookstore or locally owned small business, so much the better. Alison McGhee, Heart, Holiday, Pat Zietlow Miller, Peter Reynolds, picture books. Bookmark. I’ll be looking for this one, thank you for the recommendation! Happy holiday weekend to you all. I am so excited to read this book, for so many reasons. I love Peter H. Reynolds. And as someone who strives for simple and spare in my own writing, I think this will be a wonderful mentor text for myself – and the perfect gift for some of my little ones this holiday season. Thank you for sharing, Pat! Thank you for this recommendation. I will be putting this one on “hold” at the library, for sure. Thanks, Pat! I hadn’t heard of this one, so I’ll be sure to check it out! This sounds like a winner! Looking forward to reading it. Thanks. Sounds adorable. I’ll be watching for it. Thanks! Sounds like a wonderful addition to our Christmas collection. And I love Peter Reynolds interpretation of the little angel. Sounds fabulous! Can’t wait to read it. Thanks for suggesting studying this one. I will do it!